Students from the Albert Nerken School of Engineering proudly represented Cooper Union at the 2013 Ultimate Science Street Fair earlier this month, part of the World Science Festival, a five-day event aimed at promoting a greater public awareness of science. Open to the public in Washington Square Park the annual Street Fair aims to inspire children of all ages to explore biology, climate change, energy, math and technology, chemistry, and more. Over 175,000 people attended this year's Fair, according to organizers. Participating in the last three such festivals, the Cooper Union joined the likes of Columbia University, Rutgers University, the Museum of Natural History and many others. The School of Engineering featured demonstrations from the Center for Sustainable Engineering, Architecture, and Art – Materials, Manufacturing, and Minimalism (SEA2M3), the Origami Club and the Formula SAE Racecar Team. "This event served as an especially critical platform for Cooper Union to promote the extraordinary work that our students and faculty accomplish in our laboratories and classrooms," George Delagrammatikas, Acting Associate Dean of the School of Engineering, said. "As New York City is positioning itself to be a leader in high-technology fields, Cooper Union’s broad and rigorous education prepares our students well for leadership roles in innovation." Participants were kept busy. "Our demonstrations were completely saturated all day," Toby Cumberbatch, Professor of Electrical Engineering and founder of SEA2M3, said. 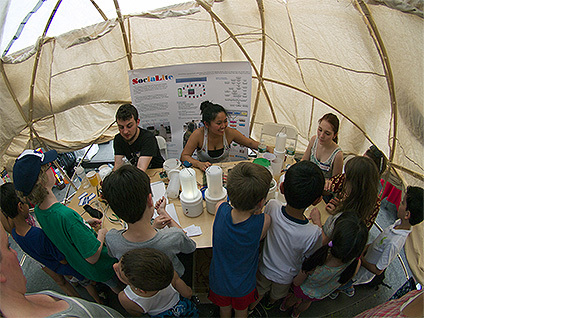 The SEA2M3 group worked inside a prototype of the inexpensive "RAMESSES" emergency shelters, developed at Cooper Union, to be delivered to one of the largest refugee camps in the world in Dadaab, Kenya. Inside, students Paul Miller, Quinee Quinta, Sasha Vera demonstrated the SociaLite solar lanterns built from easily obtained, often-discarded materials. These lanterns currently light up the Cherile and Baayire communities in northwestern Ghana, enabling children to read past sunset for the first time in their lives. "Our students were eloquent, thorough, and brought attention to Peter Cooper’s vision of doing good by addressing global crises," Prof. Cumberbatch said. 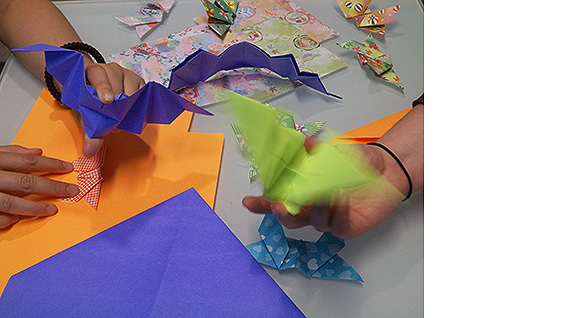 Uyen “Win Win” Nguyen and Jennifer Tashman of the Origami Club taught children and their eager parents how to fold simple butterflies and bats that flap their wings when the body is squeezed. Their three, 20-minute workshops escalated into four hours of nonstop teaching and folding. The shapes they folded were not only fun and beautiful to create, but have practical applications in science-based industries and a variety of mathematical theories. For instance, the "waterbomb base" used in making a butterfly consists of the same patterns used in medical stents that prevent blood vessel collapse in the human body. Automotive airbags, solar sails, large telescopes used in outer space, and packaging technologies are also linked to the geometric artistry they created with their visitors. 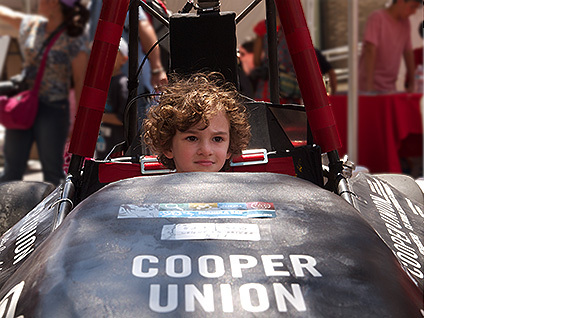 The Cooper Union Formula One car was also a huge draw, with children and adults alike wanting to climb inside. The FSAE team had recently returned from a grueling international competition in Detroit where they were one among only a third of the total teams who qualified to enter all the dynamic events. “FSAE is a flagship project at all the top engineering schools which immerses students in real-world engineering problems, teamwork, and business management," Spyros Korsanos (ME ’13), Technical Director of the Formula SAE Team, said. "We understand that the Cooper Union education comes with an obligation to help our community through outreach activities like the WSF event and others we continue to perform at school.” At the Formula SAE demonstration, one father was overheard saying to his son, "Yeah, the students actually built this car a few blocks from here, so if you want to build a car, you'll have to go to college."